This sunny cabin is located near one of the largest sand dunes in the Southern Hemisphere near Port Stephens, New South Wales. It is located in a family-friendly neighborhood that provides plenty of amenities. 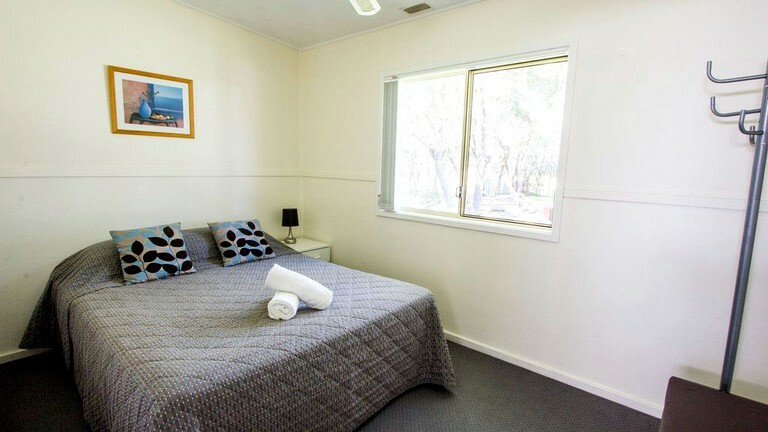 This cabin can accommodate five guests and is especially well-positioned for small families. There is one main bedroom, one sleeping area, and one full bathroom. 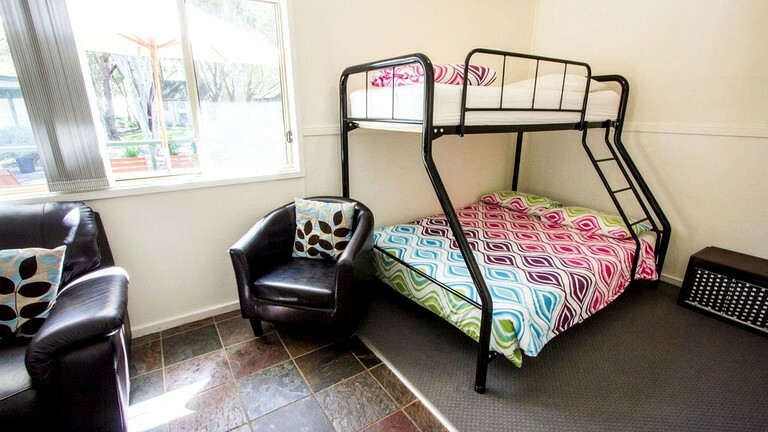 The main bedroom has a queen-size bed, while the additional sleeping area is off of the living room and has a bunk bed with a double bed on the bottom and a single bed on the top. In the bathroom, guests will find a toilet, a sink, and a shower. Linens and towels are provided. This cabin has a light, airy feel with its open floor plan and plenty of natural light. In the living room, guests will find a sofa, a chair, and a TV and a DVD player for relaxing. The fully-equipped kitchen comes with a refrigerator, a microwave, a stove, a toaster, and all the kitchenware, dishes, and utensils needed to serve stress-free meals at home. In the kitchen, there is also a table that seats four. Outside, there is a patio with an outdoor table and chairs for relaxing and sharing meals and drinks under the palms. 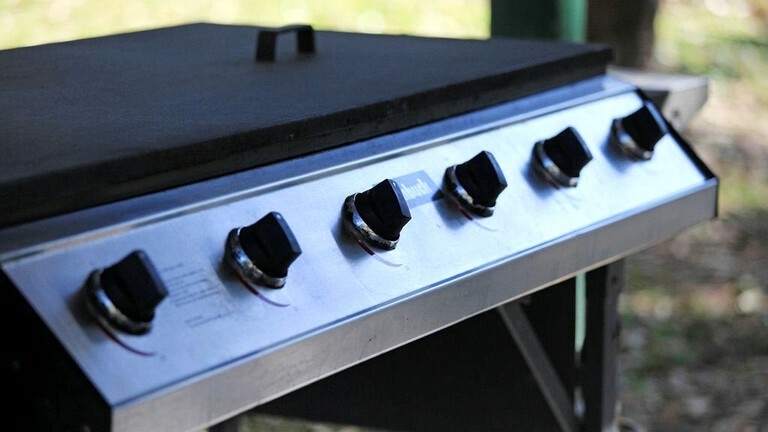 Guests have their own private picnic area with a picnic table and gas grill and can enjoy a family barbecue complete with a campfire in the cooler months. This cabin is located in a community with all the amenities guests could ask for. 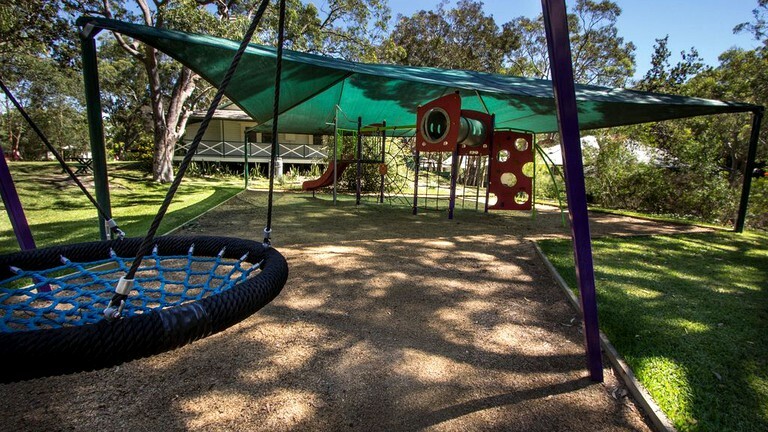 There is a community pool, a playground, a game and TV room, and plenty of natural grass areas to play sports. The cabin itself includes a private picnic area with a grill and picnic table. Additionally, it has a patio with patio furniture right outside the door. Inside, there is a TV and DVD player. Parking is available on site. 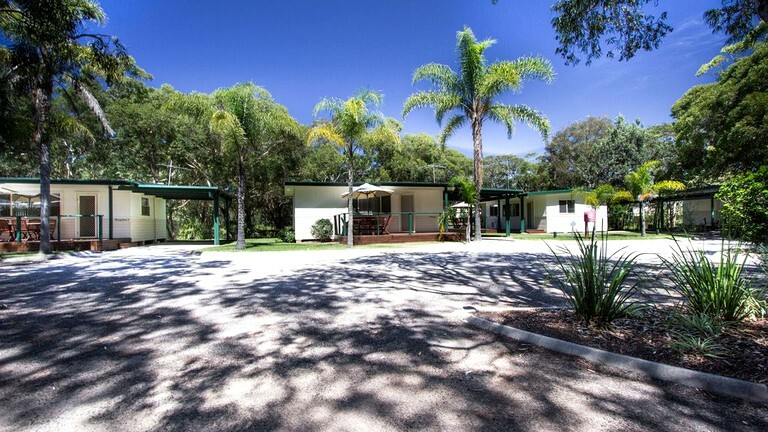 The ultimate holiday experience, this property is nestled in a bushland setting next to giant sand dunes that stretch 32 kilometers long and 1.2 kilometers wide. 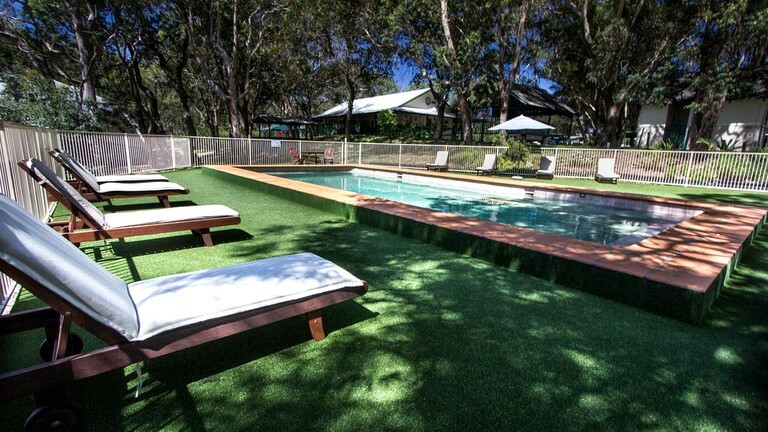 The retreat is the perfect sanctuary for couples, families, groups, and schools—offering the ultimate holiday experience to relax, explore and get back to nature. Guests staying at this cabin can walk right out to the dunes to play in the sand during the day or go for a relaxing walk at night. They can get their adrenaline pumping on ATV and 4WD off-road tours or do something a little different and ride a camel through the dunes at Oakfield Ranch. Sandboarding is another fun and unusual activity for kids and kids at heart. 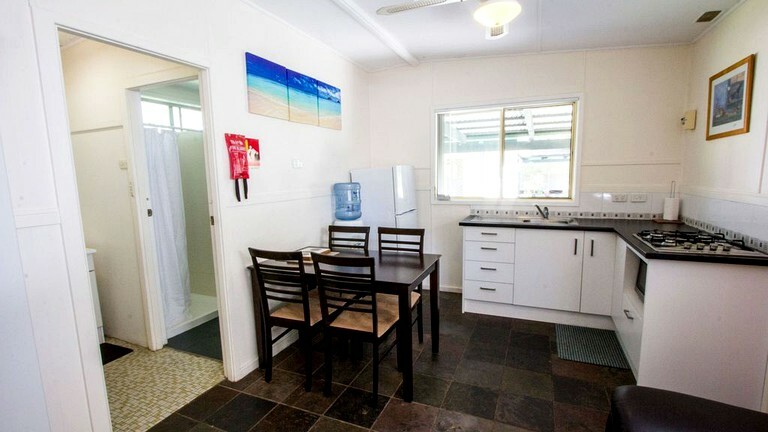 Aside from the dunes, the cabin is just minutes from the golden beaches such as Birubi Beach, One Mile Beach, Nelson Bay, Fingal Bay and Shoal Bay, which are popular in the area. 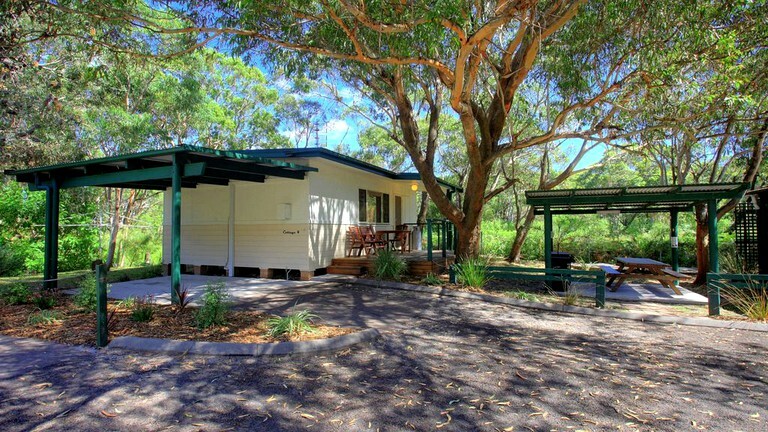 The cabin is also close to all that Port Stephens has to offer. Wildlife lovers can check out nature tours like whale and dolphin cruises and boat tours. Outdoor enthusiasts can take advantage of miles of hiking trails at the surrounding parks. One of the most notable hikes in the area is the Mt. Tomaree summit walk at Tomaree National Park. Guests not wanting to hike can still catch gorgeous vistas of the coastline at Gan Gan Lookout. Additional activities and attractions in the area include golf, fishing, local wineries and breweries, Fighter World, and more! Pets may be permitted upon request. Smoking is not permitted in any of the accommodations. Additional fees may apply for pet stays and hire items upon booking. Rates are subject to change.